A friend has lent me a home. I lent him one. A long, long time ago when I was just a new-mum-to-one. Him. His girlfriend. Their mongoose, called Pepper. And a pig. Which snuffled in the veg patch and feasted on parsley. A friend says, ‘that’s karma for you’. I think she means what goes around comes around. It doesn’t always. You’re usually lucky when it does. I remember when they came to stay. In my insalubrious – and tiny – guest house. He says we came to his rescue. As he has me. 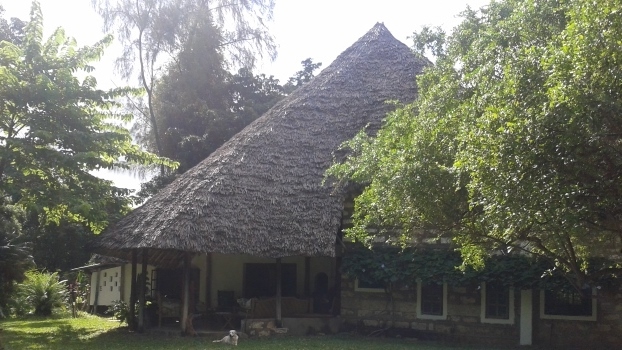 The little mango farm cottage is far grander than the ramshackle and cramped home I offered them. But I don’t remember how long for now. I wish I did. How long can I nudge such generosity I worry? I sit and the world has stopped whirring momentarily. Fleeting peace. I can almost feel things come to rest. An inertia startling stop. My shoulders slump in quiet relief. The weight of the world lifted briefly. Headaches of weeks retreat. I can breathe. Last night I slept as the dead in the inky dark which breathed quietly with crickets and fruit bats. The garden – when I last looked before my head touched the pillow – was luminous beneath a full moon . Did I dream that fairies danced there, a secret midnight ball attended by goblins and elves and sage eyed swivel headed old owls? Another friend says, when I describe the three countries, four jobs, seven houses, 18 months malarkey, ‘ I couldn’t do what you have done; I abhor change’. I do too. I did. Now I understand I must clutch the time-standing-still as it does now so that I sit and listen to music and drink wine and cook in a kitchen that feels, for now, like mine, as I register the dogs spread-eagled on the cool cement floor as if they too can finally relax. They must know it smells like home. We are agreed then; it feels good. For the first time in ten weeks I am living beyond the constraints of a car and a case. Good except for the absence of Ant who is back on the farm and trying to salvage something from the mess. He must be there. And I must be here. It’s just, we say, the way it has to be for now. It won’t be for long, we say. We do not do absences well. Ant and I. It’s why I ended up in an Outpost at the beginning of this six year long story. The same friend who professes allergy to change says she and her partner grow fractious if together too long. ‘we need regular breaks from one another’ she says so that I feel mildly feeble. Ought I, I wonder, hanker independence, autonomy, a room of my own? I don’t. I am one half of a pair. When my other half is not with me, there is a gap. A shadow. Silence. Too much space in a bed the other side of which looks cooly unrumpled come dawn because there has not been a reassuring tussle over who has the greatest share of the sheets during the night. And I have to make my own early morning tea. Which never tastes as good.